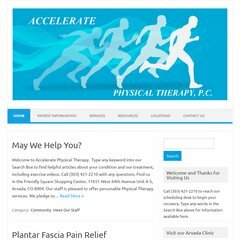 acceleratept.com Colorado Physical Therapy Services in Arvada and Thornton ..
Its IP Number is 97.74.215.181. It has 2 DNS records, ns26.domaincontrol.com, and ns25.domaincontrol.com. It is hosted by American Registry For Internet Numbers (Virginia, Chantilly,) using Apache web server. PING (97.74.215.181) 56(84) bytes of data.